This film showcases the TLEMsafe project. The film shows the case of a patient who needs to undergo a major orthopaedic intervention, including the placement of a large prosthesis. Note: Images may be shocking to some audiences. The TLEMsafe project, “Twente Lower Extremity Model for safe and predictable musculoskeletal surgery”, aims to develop a patient-specific surgical navigation system. 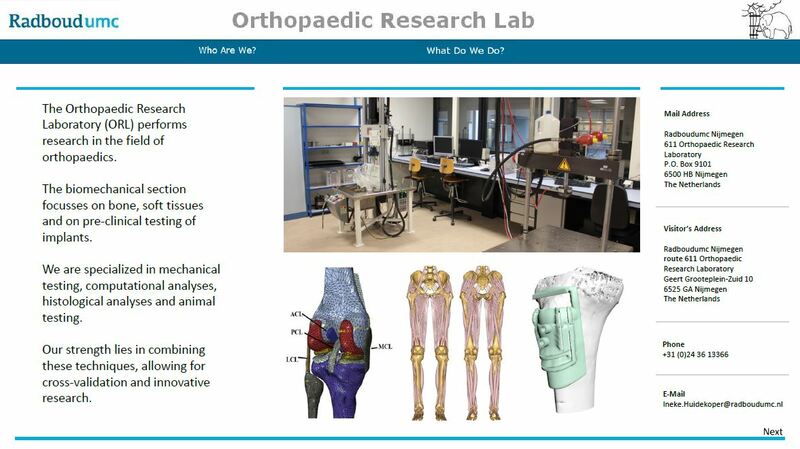 The system allows the surgeon to pre-plan and simulate the outcome of an extensive orthopaedic intervention. In addition, the navigation part of the system can be used to help the surgeon during complex musculoskeletal operations. The TLEMsafe Project is a collaboration between Radboud university medical center, University of Twente, Technical University of Warsaw, Brainlab, Materialise and AnyBody Technology. The project is financially supported by funding from the Seventh Framework Programme of the European Union.